Join one festive event hereunder during your visit in Tibet and it will surely add more to your memory of the snowland. Tibetan New Year is the most important festival in Tibet. It is an occasion when Tibetan families reunite and expect a better coming year. Known as Losar, the festival starts from 1st to 3rd of the 1st Tibetan month. Specially made offerings are offered to family shrine deities; doors are painted with religious symbols; other painstaking jobs are done to prepare for the event. On the New Year's Eve, Tibetans eat barley crumb food (Guthuk in Tibetan) with their families and have fun since the barley crumbs are stuffed with different stuffing to fool someone in the family. After the dinner it is the Festival of Banishing Evil Sprits! Torches are lit and people are running and yelling to get rid of evil spirits from their houses. The New Year is coming! Before the dawn on the New Year's Day, housewives fetch their first buckets of water in the new year home and prepare breakfast. After dressing up, people open their doors upon prayers and go to monasteries. People visit their neighborhoods and exchange their Tashi Delek blessings in the first two days. Feast is the theme during the session. On the third day, old prayer flags will be replaced with new ones. Other folk activities may be held in some areas to celebrate the events. The most important festival in Tibet is the Tibetan New Year, the importance of which equals that of Lunar New Year among the Han people, or that of Christmas in the West. The Tibetan New Year is a festival to say farewell to the current year and welcome in the new. People begin preparing for this festival upon entering the 12th Tibetan month, with sacrifices being presented on the altar of their deities and special foods delicately made to welcome the coming year. New Year's Eve is also the time of the highly important Ghost Exorcising Festival. During this day, monasteries hold magnificent sorcerer's dances. Tibetans tidy their houses and decorate them beautifully, with the belief that the cleaning will drive away evil spirits and bad luck. In the evening, after everybody has eaten Guthuk (a kind of food for the New Year), it is time for the ceremony of exorcising ghosts. Torches and fireworks are lit to scare them off, and family members will walk along a road until they reach a crossroad where they believing they can abandon the evil spirits, the spirits being unable of finding the way back to the dwelling they had occupied. Then the New Year arrives. On the morning of the 1st day, local people will make butter lamps to be sacrificed, along with grain, to their gods. 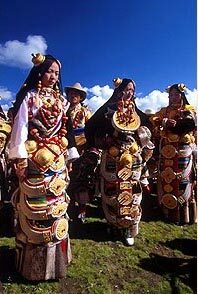 They will then don their best clothes and propose toasts with Chang (a Tibetan drink made from highland barley) to neighbors and exchange good wishes and on the second day, they pay a New Year visit to relatives. Usually, this festive event will last until the end of the Great Prayer Festival. Saka Dava Festival is observed on April 15th of the Tibetan calendar. This day is said to be the birthday of Sakyamuni, the Great Buddha, and the day he died and became a Buddha as well as the day of the arrival of Princess Wencheng (the queen to Songtsen Gampo, a great Tibetan king of the 7th century AD) in Lhasa. Many religious activities are held this day. People walk out of their houses and circumambulate around the Jokhang Temple and the Potala Palace . The three main circumambulation roads in Lhasa are crowded with devotees praying and prostrating themselves devoutly. Shoton Festival, which means yogurt banquet in Tibetan, is the liveliest festival of summer. In the past, lamas locked themselves away in their monasteries during this season to devote themselves entirely to Buddhism for a month. When their devotions were over, lamas left the monastery to receive donations from the locals. Normally, people gave them yogurt, had yogurt banquets with them and made performances to welcome them. Nowadays, in the early morning of this day, people crowd into the Drepung Monastery to watch the unfolding of the Buddha. To Buddhists, this holy ceremony is a purification of the sprit and the soul. 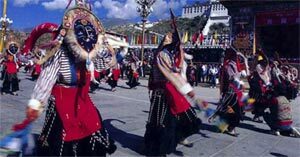 Later, this festive occasion is celebrated by performing Tibetan Opera in Norbulingka , so it has gained another name, the 'Tibetan Opera Festival'. The Bathing Festival lasts for one week in the early part of the 7th month. Legend has it that pestilence was wide spread, leading to great suffering of the people. The Avalokitesvara, one of the Buddhist deities, poured holy water into the rivers of Tibet. After bathing in the rivers, people recovered miraculously from their illnesses. Ever since, at this time every year, people bathe themselves in rivers. This custom has been handed down from generation to generation and gradually developed into a festival. It is believed that river baths during this week will not only clean the body, but also wash away potential diseases. In addition to the festivals above, there are many other festivals that are celebrated regionally, click Shigatse Festivals, Chamdo Festivals, Nakchu Festivals, Ngari Festivals, and Nyingchi Festivals for more information on festivals in these regions. The primitive religious ceremony focuses mainly on sacrifices, comprised of three kinds of activities: the burning of aromatic plants, blood sacrifices and dances. All three of these activities are considered indispensable on important occasions, but otherwise dancing is generally omitted. Burning aromatic plants is a must in any case. It generally involves burning cypress or other leaves to please the deities. For blood sacrifices, offerings of animals like sheep, oxen and horses have been made to the deities. Because of the forbiddance of killing in Buddhism, this is no longer done and taken place by other ways. Chemar, a box containing Tsampa or other grains and stuck with Butter Sculptures , is the traditional offering to deities and is still popular today. Tibetans are also inclined to offer pure waters, mandalas , butter lamps, fruits, fragrant plants and jewels when worshipping. In addition, they also use embroideries, silks and other prized cloths to decorate Thangka , statues, sutras and protect the outside stupas . All of these practices are witness to their piety. The dance performed in the religious ceremony is called ' Changmo Dance ' , or 'Sorcerer's Dance'. Its purpose is to exorcise ghosts, and it is performed by lamas, wearing masks and robes decorated with colorful strips of cloths and weapons. This primitive religious ceremony is used either in the indigenous religion, Bon or the later Buddhism in Tibet. Except for the blood sacrifice, the ceremony continues to be a local custom in the daily life of Tibetans. Tibetan Buddhism has now become the dominant religion in Tibet. Average Tibetans have many religious activities to satisfy their faith, to name just a few: reciting sutras, murmuring mantras , hanging prayer flags , turning prayer wheels , circumambulating, worshipping and prostrating themselves. In the monasteries of Tibet, apart from the regular sutra reciting and debating, a religious festival will be held almost every month, which often attracts many locals to come to worship and see their performances. These festivals have now become the most important religious activities for both locals and lamas. The following are some of the most important religious festivals in Tibet. Tsong Khapa, the founder of Gelugpa, initiated the prayer ceremony to memorialize Sakyamuni, the founder of Buddhism in 1409. 1. Jokang Temple: Sutra debating competition for the application of the highest Buddhist degree. Tsong Khapa offered some Butter Sculptures to Sakyamuni in 1409. To memorize the birth of Sakyamuni and pray for harvest in one way. 1. Circumambulating around temples, mountains, cities, etc. To learn more about Tibetan Festivals and their relative dates on the International Calendar, please write us. It is the greatest festival in Tibet. In ancient times when the peach tree was in blossom, it was considered as the starting of a new year. Since the systematization of the Tibetan calendar in 1027 AD., the first day of the first month became fixed as the New Year. On the New Year's day, families unite “auspicious dipper" is offered and the auspicious words " tashi delek" are greeted. Horse race and archert are generally popular in Tibet, andGyantse enjoys prestige of being the earliest in history by starting in 1408. Contests in early times included horse race, archery, and shooting on gallop followed by a few days' entertainment or picnicing. Presently, ball games, track and field events, folk songs and dances, barter trade are in addition to the above. It is one of the major festivals in Tibet, also known as the Tibetan Opera Festival. The founder of the Gelugpa (Yellow Sect of Buddhism), Tsongkhapa set the rule that Buddhists can cultivate themselves only indoor in summer, to avoid killing other creatures carelessly. Because creatures are most active in summer. This rule must be carried out till the seventh lunar month. Then Buddhists go outdoor, accept yoghurt served by local peopel, and have fun. Since the middle of 17th century, the Fifth Dalai Lama added opera performance to this festival. Famous Tibetan opera troupes perform in Norbulingka (Dalai Lama's summer palace). The farmers in Lhasa, Gyantse and Shangnan to celebrating their bumer harvest in this time. During that time, people enjoy with horse racing games, costum fashion show, songs and dance Archery and picnic etc. Long long ago,when Tibet was in danger of large scale invasion, the Kongpo people sent out an army to defend their homeland.It was in September and the soldiers worried that they might miss the New Year,highland barley wine and other good things.So people had the Tibetan New Year on 1st October ahead of time.To memorize those brave soldiers Kongpo people present three sacrifices an stay up at night from then on. And now it has becoe the Kongpo Festibal for entertainment like Kongpo dancing, horse race, archery and shooting. The current Tibetan calendar was started in 1027. The Tibetan New Year is one of the most important festivals, a time for family reunion and to convey greetings and best wishes for the coming new year. The Monlam Festival, lasting from the first to the 15th day of the first month of the lunar year, is the largest religious gathering in Tibet. Tsongkhapa, founder of the Yellow Sect introduced the festival, in 1409, During the festival, lamas from the three Largest monasteries gather in the Jokhang, reciting scriptures and attending an examination for the Gexi degree. The lantern show is held on the evening of the 15th day of the first month. To honor the memory of Sakyamuni, butter sculptures of figures, flowers, birds, and animals are displayed along Barkhor Street. People sing and dance in great joy throughout the night. The 15th day of the fourth month on the Tibetan calendar is said to be the birthday of Sakyamuni, and the day when he died and attained Nirvana. During this period, hundreds of thousands of people turn their prayer wheels on the street in Lhasa, and then paddle boats in the Dragon King Pool, and sing and dance in the afternoon. 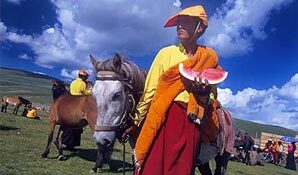 Horse racing and arrow shooting are very popular in Tibet. Horseracing appeared in the form of sports in 1408. Apart from horse racing, arrow shooting, and shooting arrows on Horseback during the festival, there are also cultural and commercial activities. Buddhists in Tibet believe this is the first day Sakyamuni preached. During the festival, people are in the best conduct. They worship and recite scriptures in the monasteries on the mountains near Lhasa, and sing and dance until the sun sets. The Yalong Cultural Festival is one of the important components of the Tibetan culture. The festival includes national sports games, folk dances, Tibetan opera, and Tibetan dress show, aiming at demonstrating the brilliance of the Tibetan culture and the new life of the Tibetan people today. The Xuedun (Fermented Milk) Festival is one of the major festivals in Tibet. In the past, Buddhists cultivated themselves in mountains. After the cultivation, their family would come, bringing with them fermented milk. On their way home, they drank the milk, sang and danced. Beginning in the 17th century, the Xuedun Festival was renamed as the Tibetan Opera Festival. Every year, famous Tibetan opera troupes perform in Norpulingkha near Lhasa. During this festival, the grandest gathering in the fall on the Northern Plain in Tibet, herdsmen pour into Nagqu, and live in tents, which stretches for miles. There are various activities, such as horse racing arrow shooting, horsemanship, and commodity fairs. This festival is one of the most important traditional festivals in Damxung County, Lhasa. The activities include commodity fairs, horse racing, and arrow shooting contests, horsemanship, and singing and dancing performances. To drive away evil spirits and to welcome the New Year, the Ghost-Exorcising Festival is held on the 29th day of the 12th month in the Potala palace, Lhasa. Such activities as sorcerer's dances in a trance are also held in monasteries in Tibet. The Festival is held in the 7th month of the Tibetan calendar, it lasts for 7 days from 6 to 12. It is exactly the end of summer and the beginning of autumn with wind moderation and the sunshine on the Plateau. Tibetans, both old and young, man and woman, from towns or countryside or pastoral areas, go to rivers to take a holy bath. It is said to be able to heal diseases and keep you fit. It is a holiday for Tibetans, looking forward to harvest. It is usually celebrated when crops are ripe, and will last three to five days. People dress up, hold colorful flags with good wishes, carry a "harvest tower" built with barley stalks and ears. They sing and dance, beat drums and gongs and walk around the fields. On this day, people also enjoy horseracing etc. Then they will begin the intense autumn harvest. Every 15th day of the 10th month by Tibetan Calendar is the Maiden Festival. Lots of religious activities are held. Tibetan women regard it as their own holiday, so they are more active and energetic than men. The 4th of the 6th month by Tibetan calendar is a religious festival for the front Tibetan area. It is believed to be the day Sakyamuni first preached a sermon with a prayer wheel. On this day, people go to monasteries and temples to pay their homage to Buddha, to offer joss-sticks and to circumambulate holy mountains; they have picnics and enjoy themselves with singing and dancing in the fields.